Revised plans have been tabled to develop a disused filling station site in Ellon. Revised plans have been tabled to transform a rundown filling station in Ellon. 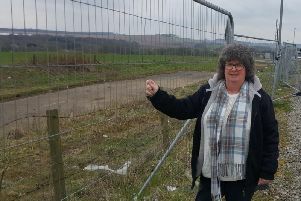 The disused Craighall site in South Road has been labelled an eyesore but fresh proposals to develop the land have been lodged with Aberdeenshire Council. Regency Oils applied last year to demolish the building and construct 16 flats. The plans, which were opposed by local councillors, residents and Ellon Community Council were turned down by Formartine area committee in September. Planners had recommended approval subject to various conditions. The developers had sought the go-ahead for an amended lay-out and design of 16 flats in a single front-facing block with a staggered front building line. Councillors had 20 objections before them voicing, among other issues, concern over parking and the impact on the area. The site on the outskirts of the town has been overgrown since the business stopped trading in late 2011 and its appearance has been criticised by many in the community. It is understood the latest proposals have the flats at the rear of the site with car parking nearer the front. One of the main criticisms of the previous plan was that it was an over development and not suitable as a gateway scheme for the town. He added: “At the moment, we have not taken a view on supporting it, or not supporting it, so we have not formulated a response to the application.